The Sd.kfz 222 is part of a family of light armored cars thatstarted with the 221. Prototypes of this series were initially developed around1937 and were produced until 1942. However these useful vehicles were used untilthe end of the war. The main difference between the 221 and the 222 was in theweapon carried. The 221 had a a seven sided open topped turret with a single7.92mm machine gun. Later in the war, a 2.3 cm anti-tank rifle replaced themachine gun. The 222 (and subject of this kit) had a ten sided open toppedturret with a 20mm anti-tank gun in addition to the machine gun. All of these vehicles were based on a Horch/Auto Union chassiswhich had either a 3.5 liter, 75 hp engine (Ausf A) or later production had a3.8 liter 81 hp engine (Ausf B). Both had the engine in the rear. The chassishad a four wheel drive, fully independent suspension. Initially, they also hadfour wheel steering, but this was removed later as it proved to be unnecessary.The differentials were full locking ensuring that all four wheels were able toprovide traction. The hull was welded steel plate with a door on either side. Theopen top was covered by a framework with steel mesh (obviously to prevent theodd hand grenade from being dropped inside). Elevation and azimuth of the turretwere manually controlled via small hand wheels. 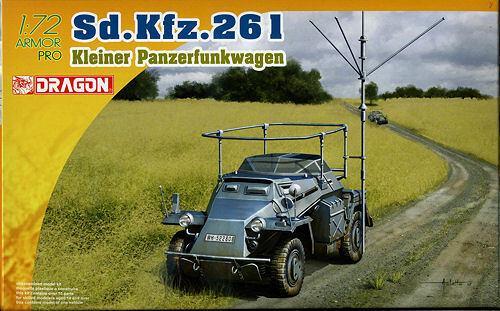 The SdKfz 261 was an unarmed radio car version. It included additional radio equipment, and had a large "bed-frame" antenna over the vehicle. Generally used for signals use, three were used as armoured cars in Finland. 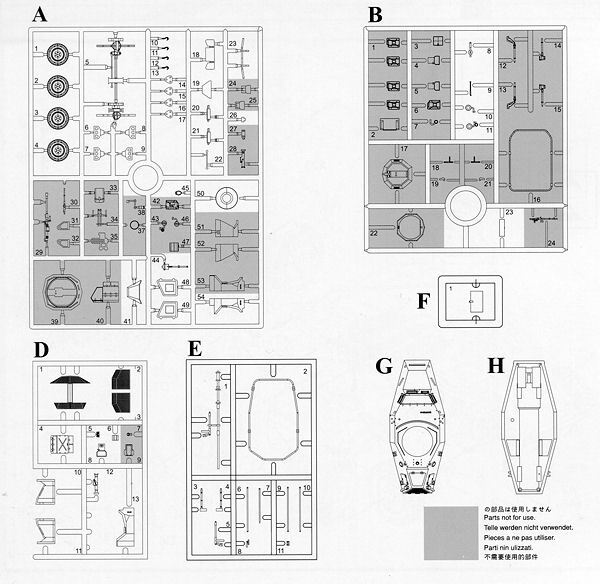 Not surprisingly, this kit is based on Dragon's SdKfz 222 armored car, but has additional sprues to take care of the radio car aspect of this vehicle. As you might note, there are a bevy of unused parts and some of the sprues are from other radio car versions. 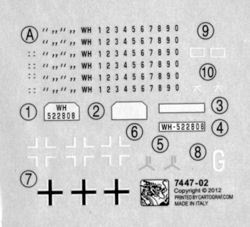 Just hazarding a guess, but it seems to me that if you wanted to, you could build several variants of this vehicle from these sprues. But then that would rather negate the purpose of buying this boxing, wouldn't it. If you have built any of Dragon's small scale armor kits, you know how nice they are. Without further ado, I'll let the Dragon PR folks list all the features of this one. Markings are basically generic plates and numbers, but there is a set of markings for a 2. Panzer Division vehicle from 1941. From what I gather, most were painted Panzer Grey. I am not sure if any were sent to North Africa, where they would have been repainted in sand. There is a bit of trimming and some holes to be opened and a few to be filled to build this version. The instructions are quite clear on exactly where this needs to be done. If you are a fan of the 222 family of vehicles, then you will certainly want to add this one to your list of kits to buy.